Build 2014 Microsoft's proposed acquisition of Nokia's handset business still has yet to pass regulatory scrutiny in Asia, but that didn't stop former Nokia CEO Stephen Elop from making an appearance at Redmond's annual Build conference on Wednesday to tout the two companies' strong ties and to debut three new phones. "In just hopefully a few days or weeks, those of us at Nokia will be joining the Microsoft team," Elop told the audience of software developers in San Francisco. Even though the merger has yet to close, however, that hasn't stopped Nokia from leading the pack where it comes to Windows Phone devices. Microsoft reps spent much of the Wednesday morning keynote discussing the forthcoming Windows Phone 8.1 update, and Elop said Nokia devices would be among the first to support the new version. 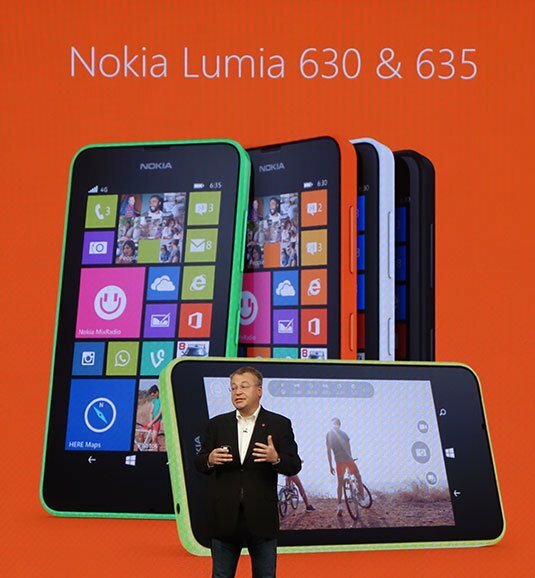 "The Lumia device that you probably have in your pocket right now gets better with Windows Phone 8.1," Elop said. "We will bring Windows Phone 8.1 to all Lumia Windows Phone 8 devices offered as an over-the-air update coming this summer." In addition, he said, Nokia devices would be the first to ship running Windows Phone 8.1 out of the box, beginning with the three handsets Elop unveiled at Build on Wednesday. The first of these, the Nokia Lumia 930, Elop described as "absolutely a flagship device built on and for Windows Phone 8.1." Housed in polycarbonate with metal accents and featuring a 5-inch full HD 1080p display, the Lumia 930 is powered by a 2.2GHz quad-core Qualcomm Snapdragon 800 processor and comes with 2GB of RAM and 32GB of internal storage. Its 20-megapixel rear camera features ZEISS optics, optical image stabilization, and an array of four microphones for high-definition audio recording. It's also a nice-looking package, available in black, white, green, and orange. If there's a downside, however, it's the price. At $599 before taxes and carrier subsidies, the 930 could be a hard sell versus comparable Android mobes. Not to worry, though, because the other two handsets that Elop announced on Wednesday – the Lumia 630 and the Lumia 635 – follow in the steps of the wildly successful Lumia 520 by keeping the price tag low while still offering respectable specs. The two low-end devices are mostly identical. Both feature 4.5-inch displays, 5-megapixel cameras, 1.2GHz quad-core Qualcomm Snapdragon 400 processors, 512MB RAM, and 8GB internal storage. The main difference is that while the 635 supports 4G LTE connectivity, the 630 is a 3G phone that comes in versions that support either one or two SIM cards. The single-SIM 630 is expected to list for $159 before taxes and subsidies, while the dual-SIM version will go for $169 and the 635 will retail for $189.